I’ve never really been a fan of Fantasia. Never checked for her during her American Idol days, never really liked any of her albums (though all of ‘em had a couple of bangers here and there) didn’t really rock with her reality show like that either. But don’t get it twisted, no matter how much I wasn’t checking for Ms. Barrinto I would never front on her live show game cause her name definitely rings bells in that arena. You give this chick a mic and a stage and she gonna take you to church errytime. But I eventually ended up throwing her in that same bag I keep Jennifer Hudson in. That bag of folk who can REALLY sang but just can’t make good albums to save their life. Almost like back in the 90’s when you had these dope freestlye rappers like Supernatural and Mad Skillz but neither could ever make a good album…so yup, that’s how I saw Fantasia. So, if I don’t mess with Fantasia, what made me check out her new album “Side Effects of You?” Well, to be honest and this is gonna sound kinda harsh but…there wasn’t nuthin’ else out and I wanted to hear some new music. So, basically this chick worked her way into my rotation by default. But it doesn’t really matter why I listened to “Side Effects”, the important thing is that I did listen to it. “Side Effects” sets off with the banger “Supernatural Love” featuring Big K.R.I.T. which follows the blueprint on how to set off an album off right cause this jawn goes hard. Your favorite MC would EASILY annihilate this beat and if K..R.I.T. is your favorite MC, you actually get to see it happen. “Ain’t All Bad” has a reggae feel to it that will remind you of Jazmine Sullivan’s Need You Bad”, “If I Was A Bird” is just flat out beautiful and “Without Me” has Fantasia and her crew (Kelly Rowland and Missy Elliott ) pulling their man’s card while letting ya’ll know how it beez in the trap. The title tracks has Fantasia explaining her side effects of dealing with her man, “you’re suppose to take away the pain/but it hurts the same/and it’s getting harder/I thought you were taking care of me/but I can’t breath,/and it’s getting harder.” “Get It Right” has Fantasia telling us to “give the mother f-cking drummer some” while doing her best Andre 3000 impersonation, “Change Your Mind” has Fantasia channeling her inner Whitney Houston’s “I’m Your Baby Tonight” and how can’t you rock with “So Much to Prove” that uses the The Silhouettes drum break that Pete Rock made famous with his “Soul Brother #1” off his “Soul Survivor” album? Now, the funny thing about the 1st single, “Lose To Win” is when I first heard it, I hated it. Probably because of the blatant use of the Commodores “Night Shift” sample. Every time I heard it, I just kept hearing “Marvin, Marvin, Marvin…” which made me wanna hear “Nightshift” so I never really gave the song a try. But I stumbled across this video of Fantasia and Harmony in the studio and seeing how hype Tasia was recording that song and the passion she was singing with I had to give the song a chance. And guess what? I rock with it now. One of the dopest things about this album is it ends just as strong as it starts and that’s something that 90% of albums nowadays fail to do. “End of Me”, “In Too Deep” and “Haunted” featuring Tank and King Los are all bangers but “To The Heavens” ends the album perfect cause this jawn will have you wondering what’s coming next. One minute it’s a ballad and the next I see people Harlem shaking in my head and I’m expecting Will I Am to jump out my speakers. The other dope thing I love about this album is Harmony Samuel’s (not to be confused with Chuck Harmony) production. During this album money basically covers the entire spectrum of current black music. From straight up and down hip hop, trap music, ballads, electro, pop and the list goes on and on. And with this kinda production and Tasia’s voice, there’s no way she can lose on this album. So has Ms. Barrino made me a believer this go round? Hell yeah! I’ve always said to anyone who will listen that one of the things that’s killing music nowadays is these artists working with 15 different producers but trying to make a cohesive sounding album. 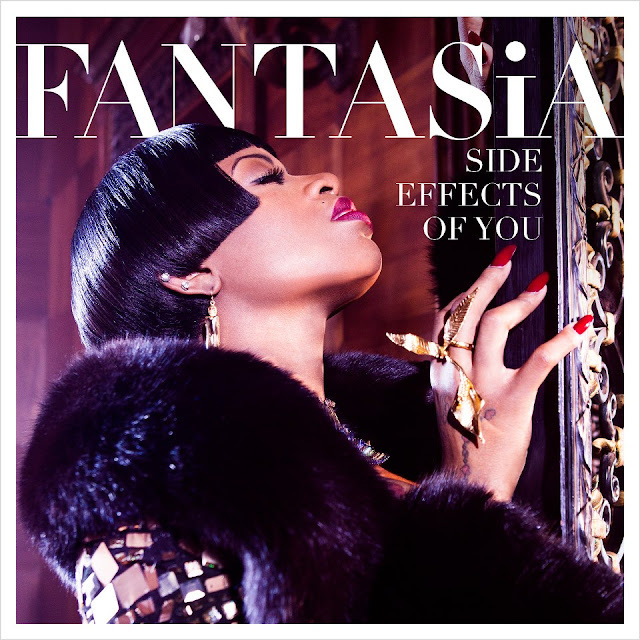 And I think the reason why “Side Effects” is so good is because Fantasia’s only rocking with one producer this go round. And I think that’s what separates this album from her past efforts. It’s obvious these two have a dope chemistry together and prayerfully we’ll be hearing more from this dynamic duo in the future and if we do then Ms. Barrino can count me in for rocking with her for the long term.